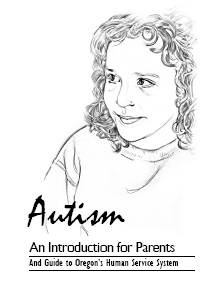 The book­let was writ­ten and edited by two moth­ers of chil­dren with autism. It gives basic infor­ma­tion about the dis­abil­ity and sum­ma­rizes resources avail­able through the Depart­ment of Human Services. Catherine Strong and Mary Anne Seaton first produced this booklet in 1996 as a labor of love. Both are parents of children with autism. They met when Catherine’s daughter was diagnosed 12 years ago and Mary Anne visited their home to answer the questions that Catherine and her husband Ted had about autism. That kitchen-table conversation was the inspiration for this booklet. Who: People w/ disabilities interested in a Halloween Party! This will be a great opportunity to for young people with disabilities to learn about what we do, meet new friends and have a great time. Many thanks to the Children’s Healing Art Project for allowing us to join this event! Emerging Leaders Northwest is a youth led resource center for young people with disabilities ages 13 – 30 which provides training and resources on leadership, independence, getting a high school diploma and going on to college, self-advocacy, employment skills and living a healthy lifestyle. Youth leaders facilitate training for their peers and act as mentors. Leaders may also gain valuable employment experience by participating in internships in business and non-profit entities. Our meetings are held the fourth Friday of each month from 1:00 – 3:00 PM at the Child Development and Rehabilitation Center, Room 1125, 707 SW Gaines Street, Portland, OR 97207. A new “Now What” Group is now forming in the Tigard area. This is a private-pay opportunity for individuals with Autism or Asperger Syndrome offerings tools, support, and social experience for post-high school young adults, (age 18–28 years). This series of 12 sessions is designed to address some of the cognitive-social issues that are common to individuals with Asperger’s, Non-verbal Learning Disorder, and High-Functioning Autism. Our group supports the inclusion of a variety of abilities. The series follows a sequence of topics that range from discussions about the member’s individual interests, to talking about plans for the future. Our final meeting is a “group date” for dinner, during which we enjoy each other’s company and apply some of the things we have discussed over the preceding weeks. The topics that we discuss overlap from one series to the next, but this is not a comprehensive course. We often have much more material than time to cover it. There is new material in each series. As a consequence of that, and of having some new members in each series, it is a different experience every time we do it. Each series is, to some extent, tailored to the needs of the members. Many members are returning from earlier groups. We are committed to providing an emotionally and physically safe environment. In order to maintain that safety, we discourage negative comments, and will not tolerate disparaging remarks directed at any member. We maintain confidentiality and respect for the young adults who participate in the group experience. Each weekly meeting builds on the ones before it. In order to get the most benefit from the series, it is important that members attend every group. It is also important for the members to be able to count on each other’s support from one week to the next. We know that life happens. If you know ahead of time that you will not make many of the groups, it might be better to consider joining the next series. $55* per 90-minute group. 12 weekly meetings. Skills Notebook and other materials included. *NOTE: Brokerage funds cannot be used to pay for this resource due to the rate structure. Kristinachew.com – Kristina Chew is a Classics professor, mother of a 12-year-old son, Charlie, who’s on the moderate to severe end of the autism spectrum, a translator and teacher of Latin and ancient Greek and a blogger, formerly at My Son Has Autism/Autismland (2006-2008), Autism Vox (2006-08) and Change.org (2008-09). She’s currently writing a book about life on the long road with Charlie. Parenting and Teaching Kids with Aspergers – A comprehensive site with resources, suggestions and support for parents and teachers of individuals with Asperger Syndrome. Wrong Planet – A web community designed for individuals (and parents of those) with Autism, Asperger’s Syndrome, ADHD, PDDs, and other neurological differences. We provide a discussion forum, where members communicate with each other, an article section, with exclusive articles and how-to guides, a blogging feature, and a chatroom for real-time communication with other Aspies. Some quick stats on Independence Northwest’s current customer base. Independence Northwest serves 450 adults with disabilities across Multnomah, Clackamas and Washington counties. Oregon Helps is an online clearinghouse that takes you through a series of questions online to determine what services you or your loved one might be eligible for. The site’s services are available in multiple languages. Check it out here. The Oregon Council on Developmental Disabilities has just published its latest issue of Oregon Perspectives. The summer edition focuses on Employment Opportunities for adults with disabilities in Oregon. Be sure to check it out. The Oregon Training Series on Direct Supports will be sponsoring an exceptional opportunity on January 30th, 2009. Acclaimed author, trainer and advocate John O’Brien will be making a rare Oregon appearance and we urge you to take advantage of this opportunity. To view the flier, click here. This isn’t OCDS’ only opportunity. Visit their website for a number of excellent trainings on disability over the coming months. For a recent article in USA Today detailing the IRS’s efforts to reach out to seniors and veterans with disabilities, click here. For state fact sheets on unclaimed stimulus payments, click here. Via Academy of Special Needs Planners. Thanks to Washington County Developmental Disabilities Program for the info. There’s a Respite Provider search and a comprehensive listing of agencies and individuals serving the disability community. We have partnered with Disability Compass in the first year of our operations and highly recommend this resource. People looking for help in Portland and its surrounding communities often do not know where to begin. Locating such basic resources as food, shelter, employment, or health care may mean calling dozens of phone numbers, then struggling through a maze of agencies and services to make the right connections. 211info is built on a quarter-century history of restoring dignity to people’s lives by providing comprehensive information and referral service in this region. Are you set to turn eighteen soon? Independence Northwest is enrolling an unprecedented number of individuals turning eighteen with an existing Family Support Plan. When you come to Independence Northwest (or any brokerage for that matter) at the age of eighteen, your experience is a bit different than other customers. Because you have an existing plan, we have to “transfer” over those services (and the people who provide them) so we can provide you with continuity of care. We have created a guide to help you understand what’s happening, when and why. Check out our guide here.